The inspiration for this lamb dish might come from the warm climes of northern Africa but nothing could be more satisfying on a cold winter's night. Place each shank on a large, double piece of foil. Grind the garlic, coriander, cumin and saffron in a pestle and mortar; season, then rub over the lamb. Dot the butter and preserved lemon between the shanks; lift the foil, scrunching to make two parcels. Bring the water in the steamer to the boil. Steam the parcels, covered, on a medium heat, for 2 hours 15 minutes; add more water if necessary. Remove from the heat. Put the couscous in a bowl. Melt the butter in 200ml boiling water, stir in the salt, then pour into the couscous. Cover with a clean tea towel and leave for 10 minutes, then fork through the other ingredients. 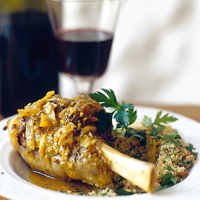 Unwrap the lamb; keep the juices to spoon over the lamb and couscous before serving. Great Syrah wine has an exoticism that is just right with this lamb dish.